Unthinkable: What’s the use of poetry? William Faulkner Makes Us Wonder: What’s So Great About Poetry, Anyhow? 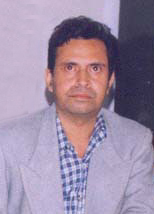 Jaydeep Sarangi with four volumes of poems is widely anthologized in different continents. 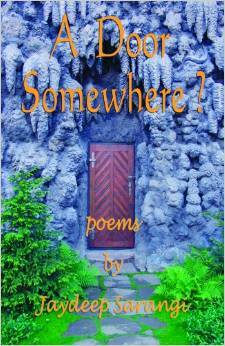 Latest collection of poems ‘A Door-somewhere’ was released at Rzeszow University, Poland when he visited the country as a visiting Professor in 2014. Fifth collection of verses The Wall and Other Poems is likely to be released in Norwich, UK in June 2015. Jaydeep Sarangi is perceptive and each moment makes an impression upon his gentle heart. As a man of emotions and delicate poetic thoughts, he tries to reach out to relations with warmness. In prayers, he strengthens relations. A mother is a deity for the poet, for she acts as a refuge. Nostalgically, he goes back to ma so that she listens to what innocent breathings tell. Innocuously, he takes everyone to the lap of mother to seek relief when one fails to get succor outside, for the world looks callous and apathetic. Images continue to assault incessantly and the poet struggles hard to dispel darkness, ambiguities create. In a single moment, he travels a long distance in experiences, thoughts and emotions. At times, innocent hearts carry a man to a land of mystery, and teach lessons of life when a man is a simple visitor and looks out for a little divine and everything that takes place around puts a question mark, for in imagery you unearth many meanings and yet you understand nothing. Unlocking of past is a puzzling suggestion because it carries to eerie happenings where fairies, ghosts and strangers scare but excite. Experiences appear awe-inspiring as one remembers magnificent days as life moves and hints at a strange merger of ancient times with contemporary ordeals life faces and here, life seems hectic, and rotates around ‘tube and tyre’ 17, a monotonous innuendo to a dreamy sequence. The thought reemerges in “Mystery of the Land” and gets identity personified, for going back to past and land of birth grants peace, a truth many would accept and to this extent, the poet speaks for men, who love and value land, its people and relations. A man gets relief, safe haven, light and wisdom as darkness diffuses and liquefies. Social realities disturb as insightful intellect tries to find solutions, which prove mirages –a genuine obstruction elite face, and at another moment, a door symbolically takes him to fresh vistas of fulfillment and delight that continue to linger on a stage of fantasy. Possibly, door signals openness, a life of anticipation and joy, of probable hurdles leading to ultimate enchantment though transitory but the poet refuses to confess. Door enshrines mysteries. One lives, for one believes life beyond death. Life is relaxed if a man lives in thoughts of gratifying indefinite. Man must open doors to knowledge and joy, and possible indeterminable salvation (?) if he seeks meaning. Surprisingly, the poet turns to the hard life some people live. I have seen the tears of the oppressed. I save my ancestors as you save your missing links. In life, words transform to images and fantasize living, and a man reflects over the impossibilities. He knows variations in little shades life offers because meaning in confusing situations has a different objective. In images, he tries to find undertones of mystery life contains but he understands life is not a dream but reality and to anchor it strongly, struggle must continue, for it sustains life. Poet’s lyrical journey to past and present and again to past, remains paranormal, and human ties carry the burden of delicate little thoughts and emotions tentative. He thinks of mother, land and a few relations when questions of earning livelihood engage. He wants to express, collects words but fumbles for a fulcrum, “She allows me to see the world /Through fissures in the dreamy wall /A matchless majesty fills my heart. / I demand to speak with God /I have business with him,” for he has yet to find answers to mystic questions about life that haunt and finally, when he returns, even the ancient path he left long ago, assists him in finding destination unspecified. He is hopeful, for ‘Each time I read history / I find a door somewhere’ and adds, “It’s a door between the self and the world, /Despair dances in Hope.” and that offers definite meaning to life. A Door Somewhere offers enjoyable lines, for living in a world of fresh and exciting images is an experience. Transmitting sensory experiences in fine and definite word-pictures is an art and in this little lyrical book of images, one moves from nowhere to somewhere with a certain purpose where one finds life challenging, worth living and meaningful. Here I am, getting acquainted with Sadia Riaz Sehole’s maiden book of poems Red Seeps, Droplets of Doubt, Destiny and Devotion in Verse. The airy blue of the cover, with the title oozing red, belies the monochromatic visuals on the inside, both, together with the layout by Geetali Baruah. Striking! Will the 3Ds (Doubt, Destiny and Devotion) turn the readers into oysters that will nurture the pearl shown on the cover page? To find the answer, I obviously had to read the poems. Poetry, to be good, should blend craft and magic; it should flow from the union of head and heart. All emotions can make a poem mushy…only hard-headed thoughts, without the mellowing edges of feeling and a poem can sound harsh and abrasive. Here’s what I found in Red Seeps. The poems are short, some of only four lines and simply crafted. They spew angst, screams, dumbed-down dreams, smothered passions, hidden trauma – the exploration and revelation of the trajectory of a tempestuous emotional journey. A raw vein aches and pulsates through the book, interjected here and there by hope, prayer and courage. These try to balance the unnerving, unexpected harshness of the world with mature thinking. Each black and white image too is startlingly perfect…a stark reflection of the poem it illustrates, one complementing the other and making the book a visual delight despite its disturbing darkness. One could easily say the poems are ‘I-centric’ because almost every verse is in the first person but that would be over-simplifying and undermining their universal impact. Though she is a woman and I can identify with her, let me clarify here that this is by no means a diatribe against men. Nor does Sadia whine in self-pity. Her quiet words give voice to all silent sufferers – male or female. One poem that haunts is ‘Silent Screams’. “Alone and exiled/Disdained and assailed…..
‘Lament’ is another very relatable poem. Hope, courage and self respect peep through ‘Torn Yet Not Worn’. “Yet little by little/A brave, relentless struggle/Regaining my pride/Carving my way…”. 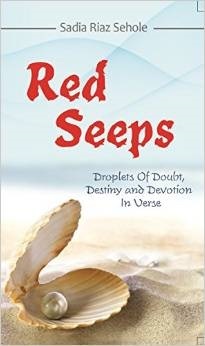 The title poem ‘Red Seeps’ is about the cathartic value of writing – Inconsolable and insane/I picked up the pen/And here red seeps…. Yes, the red of welts on the spirit, the red of passion, the red of open wounds and suppressed anger seeps on the pages of this anthology but there is also the incandescent colour of faith and devotion – “To the One and Only Invisible Being”, “Glory Unto You God, The Gracious”; if there is the blue of gloom there is also the glowing crimson of love – “Paean To My Parents”, “That’s What I’ll Be Without You”, “Dear Unseen Friend Across The Border”, “Brother, Brother, Oh My Brother”, “A Friend Like You”, “Nectar if Love”, “Absent”. We also see the grey of doubt “Bewildered”; and the ambiguous hue of fatalism – “Me”, “I Wish To Die”, “This World”, “Time Ticks”. There are many more tinges and colours here, splashed from the spectrum that is life. I feel tempted to reveal them but I think it is only fair that I leave it to the readers to find those that blend/merge with/clash against the colours on their individual palettes, trickling through the vignettes of their life experiences. This is a fare bridled with the complexities and paradoxes of life. It is not so much Freud’s ‘play of childhood’ flowing into her creativity; it is the angst of youth. 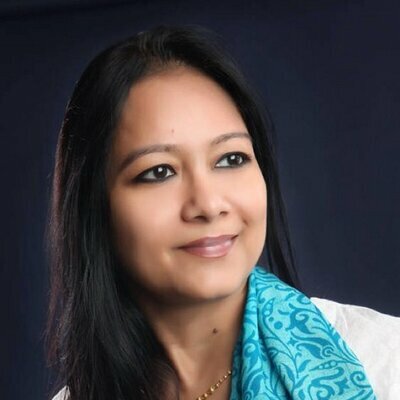 As Sadia weighs and processes her experiences and feelings we get glimpses into the twilight of a tormented soul; we see the ferret of fear gnawing; with her we also realise that there is hope – In my lonely world/Yet dawns a hope benign/An oyster may come/And make me its pearls. This is the complete poem titled ‘Ray’. The preface by Vinita Agarwal is very sensitively discerning. 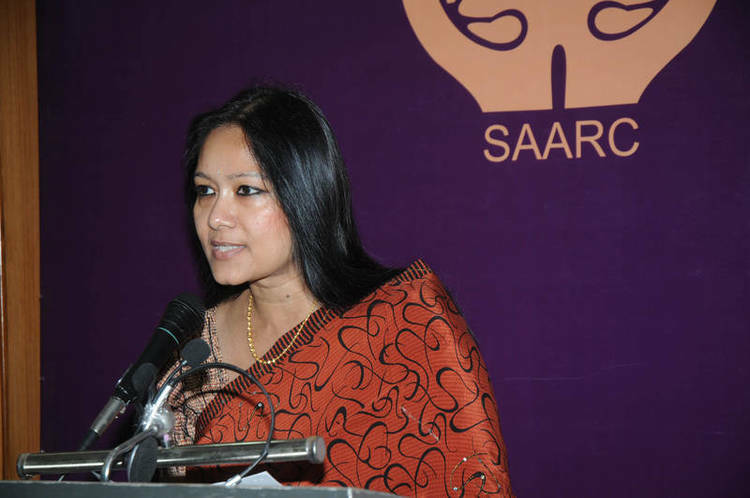 Before I end, a little about Sadia Riaz Sehole. 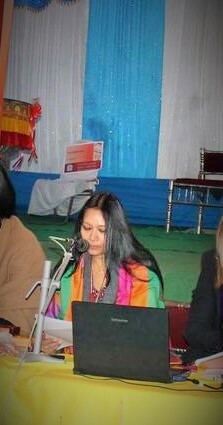 She is a teacher and researcher, born and brought up in Lahore, Pakistan. After an early education in Science, she pursued Literature and is currently working on her PhD dissertation..
Now try and get to know her better, through her impressive book. I begin on a very personal note. Today I am in Jorhat in a posting for the university I work in. In the 1970s when I was a college student I first watched the movie ” Pakeezah ” in Sibsagar which is around 50-60 kilometres away from Jorhat. When I saw ” Pakeezah ” what struck me was the anguish of the heroine, and to my mind the real impinged upon the imaginary- what I mean to state is: in being absorbed in Meena Kumari‘s acting I felt that in reality she might have experienced the anguish of the protagonist, empathy or call it what you will. I remember snatches of the movie, but what I can recall is breathtakingly brilliant acting. Somewhere at the back of my mind was the Kamal Amrohi ‘ story ‘ and I was also aware of the fact that this intensely poetic movie was directed by him. Perhaps this was one of the most ‘ poetic ‘ movies I have seen in addition to say Satyajit Ray’s ” Charulata ”. In reading these translations one is not only transported into the world of ineffable poetry, but one is made aware of deeply felt sensitivities and questions such as life, death, love and relationships. This kind of poetry is ‘ opposed ‘ to the kind of clever, cerebral poetry we are witness to today. It is poetry of the heart and felt experience. Yet the motifs are many and varied: light, darkness, night to name a few. The obsession with night is a haunting reality and leitmotif in the poems. 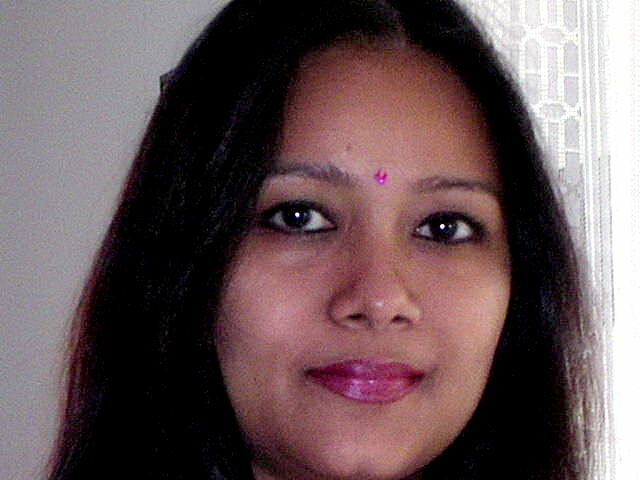 Bharati Mukherjee once said that a creative writer writes out of obsession. 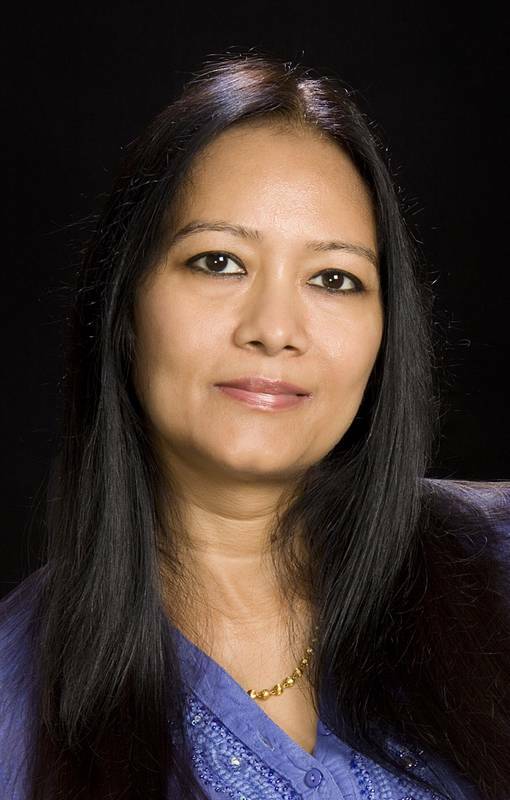 Meena Kumari’s obsessions with night, darkness and an intuitive feeling of death give to her poems a starkness. Yet hope in some way or the other does figure, but there is again and again, questioning and self questioning. Darkness and night are not synonymous here, while darkness is metaphorical, night signifies an end, or an open ended question which the poet is forever grappling with. These are sensuous poems, they echo perhaps Omar Khayam , but there is no hedonism. Yes there is celebration, that of life and poetry, life’s dualism, painful living, unrequited love which are some of the themes present here, themes in the context of the poems which are cataclysmic. Some poems have turn of phrases which are aphoristic. There is constant and recurring interplay of light, darkness and scalding nights! This gives to her poetry many dimensional aspects, at the same time making them lyrical and evocative. But it is always the pain that rings through clearly, The pain of irretrievable love, the pain of being a woman, the pain of the inner conflict having to ‘ live up ‘ to the celluloid image. 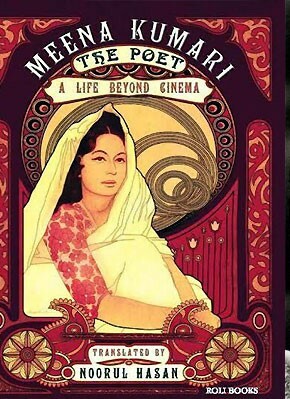 In their excellent introduction Daisy Hasan and Philip Bounds assert that the poems can be viewed as a ‘ barbed critique ‘ of popular culture, the culture which Meena Kumari represented through her films, but which ironically and trenchantly took away her life. The poem ” The Empty Shop ” is perhaps a commentary on crass consumerism. The ” Shop Of Time ” she says is vacuous, gives nothing. In the poem ” Words ” there is juxtaposition of words, light and darkness. That a public figure is desperate to get away from this image and live more ‘ privately ‘ is something that can happen to ‘ celebrities ‘. The example of the Bengali actress Suchitra Sen is a case in pint. She shunned any public gathering for almost four decades! All that I have said above would not have been possible if one cold not read these cogent translations of Noorul Hasan. They are very well crafted and attempt to be as sincere as possible to the originals. Yet translators do take some liberty. This is the poetic license here. The translator has done painstaking work which is researched, and I am sure over quite a period of time. This shows the hard work and tenacity that have gone into these brilliant translations. Through these translations Noorul Hasan has made a contribution to the world of poetry, revealing Meena Kumari’s true penchant for the pen. 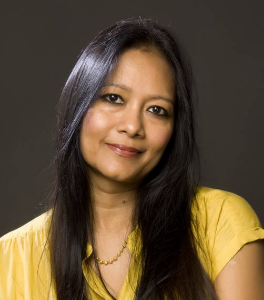 -Ananya S Guha works at Indira Gandhi National Open University (IGNOU) as a Senior Academic. 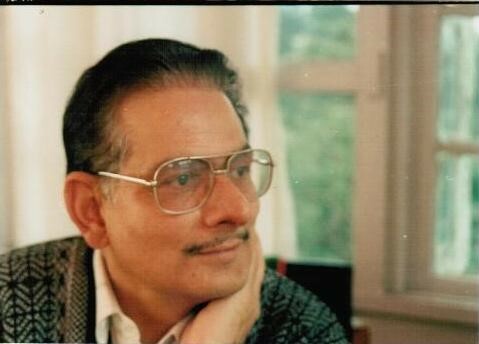 His poems in English have been published in International / National Journals and e zines. He also writes for newspapers, does book reviews and writes on matters related to education.His recent works appeared in the Harper Collins Book of English Poetry edited by Sudeep Sen. He also writes book reviews, articles for newspapers and articles on education, distance education and vocational education. Audacity and ambition fused to a poetic temperament can get you a long way. 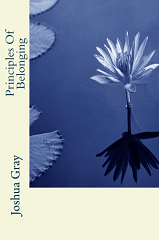 Joshua Gray in his second book of poetry, Principles of Belonging, pushes the envelope in his artistic efforts to create a masterpiece of poetic unity. He nears a crescendo, but doesn’t quite get there. Yet he does give us a compelling narrative encompassing national tragedy, dysfunctional families, young love, and an overview of life’s ironies. That ain’t bad. Along the way Gray melds Sanskrit meter, Anglo Saxon verse, Welsh measures, blank verse, free verse (sometimes rhymed), not to mention sonnets, other rhymed poems and a sympoe ( a strange poetic form invented by Gray). The Sanskrit lines, the rules of which were developed well before the Homeric Age, soothe you with their subject appropriateness. The lines or padas are four feet of four syllables each, making sixteen syllables on a line. Excessive syllables are sometimes okay, but are not counted. The syllables are considered light or heavy depending on the juxtaposition of consonants and vowels. The rules are really simple and elegant and, in narrative forms, almost prosy. Gray avoids numerical intricacies and high art sophistications, keeping the original rule-based simplicity in his English adaptations. Keep in mind that virtually all Sanskrit, including law, science, and mathematics, was composed in verse. For those interested in further pursuits of this form I found a book by Charles Philip Brown written in 1869 entitled Sanskrit Prosody and Numerical Symbols Explained (London 1869). It appears to be part of an academic collection and is easily located on the internet. a log from the fire, then chased the boys around the house as they ran out. before either of them could. The boys stayed out past the rise of the moon. The next morning the train stopped in some town and everybody got off. of Muslims waited to board the train traveling the other way. A sole chai-wala called out as he walked, clay cups in hand, hot chai balanced. Would even mindlessly find a new future. Or warmed by the sun, the wonderful flora could take her in winter. Elaborate and elegant both! Gerard Manley Hopkins used this form to great effect and Dylan Thomas was clearly influenced by it. Perhaps it’s mine where truth can truly be. I will not dance to illusion’s crippling song. And didn’t travel with us on the train. So where did all that I recall take place? I must have placed my parents in that space. This lady of light refused to keep me proud. Determined mothers make their children’s clothes. And walked a ways for fabric, rain or snow. The ‘S’ was crooked, the cape a little green. The thread and needle helped me quite a bit. Just for its poetic nerve and intrinsic formalist interest this book gets an “A” as in audacious. With a nod to what this book may ultimately become, I celebrate its already significant accomplishments. 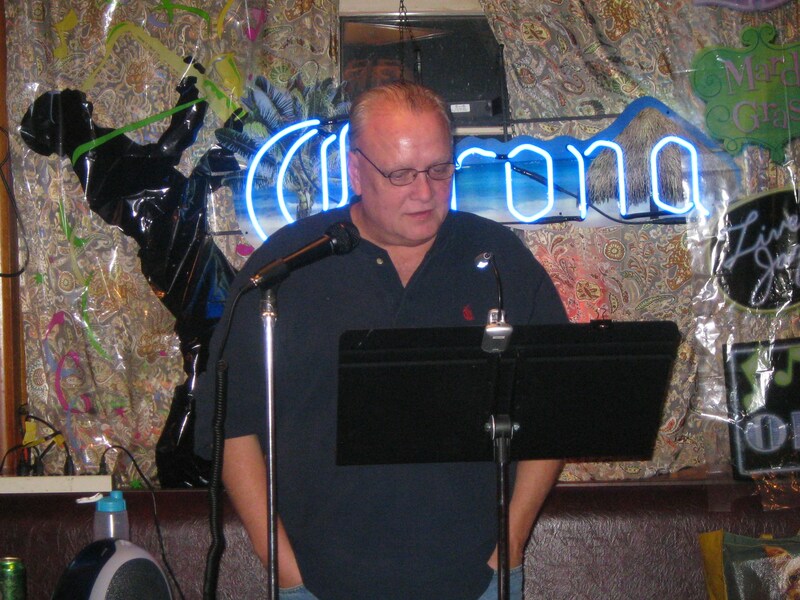 Dennis Daly has been published in numerous poetry journals and magazines and recently nominated for a Pushcart prize. 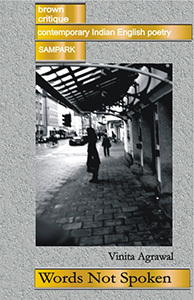 Ibbetson Street Press published The Custom House, his first full length book of poetry in June, 2012. 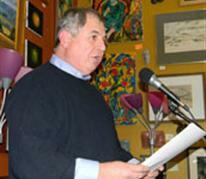 His second book, a verse translation of Sophocles’ Ajax, was published by Wilderness House Press in August, 2012. 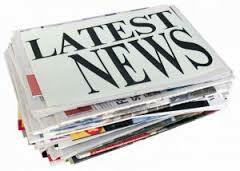 His third book of poems entitles Night Walking with Nathaniel has been accepted for publication by Dos Madres Press. A fourth book is nearing completion.